Dropbox Showcase is a way to share your work with partners and clients on a single page. You can guide people through your content, add your own branding, and automatically keep track of who views, downloads, and comments. These assets will appear on the showcase page, as well as in the email that’s sent when you share your showcase. Click Showcase in the left sidebar. Select an existing showcase or click Create showcase to make a new one. Open the showcase you'd like to copy. Click Make a copy again. Note: The duplicate copy of the showcase will have (Copy 1) appended to the title. You can add multiple files, from Dropbox or elsewhere, to a single showcase. For example, a single showcase may include image files, Dropbox Paper docs, and non-Dropbox docs and spreadsheets. The files will display as a preview with customizable layout and appearance. People who you share your showcase with have the option to view or download .jpg and .pdf versions of the files you include in your showcase, as long as they can be previewed in Dropbox. Single-click the file, image, or block so it’s highlighted, and then click the Delete icon (trash can) in the toolbar. To add a new title to a showcase, single-click Give your showcase a title, and type. To edit an existing title, single-click the current title, and edit. You can add a featured image to your showcase that will appear at the top. The source of the featured image should be a minimum of 350 x 350px and a maximum of 1000 x 350px. To add a featured image, click Add a featured image at the top of the showcase. To change a featured image, single-click the image so it’s highlighted, and then click the Replace image icon in the toolbar. To change the position of a featured image, single-click the image so it’s highlighted, and then choose from the icons in the toolbar. To change the appearance of the image (Zoom out, Zoom in, or Fill), single-click the image so it’s highlighted, click the Adjust image icon in the toolbar, and then choose from the icons. Note: If you hover over the icons in the toolbars, you’ll see a description of what each one does. Once you've uploaded a logo to a showcase, you can reuse that logo in future showcases. You can also upload multiple logos, and choose between them. Click Add a logo at the top of the showcase. Click New logo to upload a logo, or click a logo you’ve previously uploaded to Showcase. To change a logo, single-click it and then click the Replace image icon in the toolbar. To add an introduction to your showcase, click Add an introduction, and then type in the text box that appears. To edit an introduction, single-click the existing text and edit. 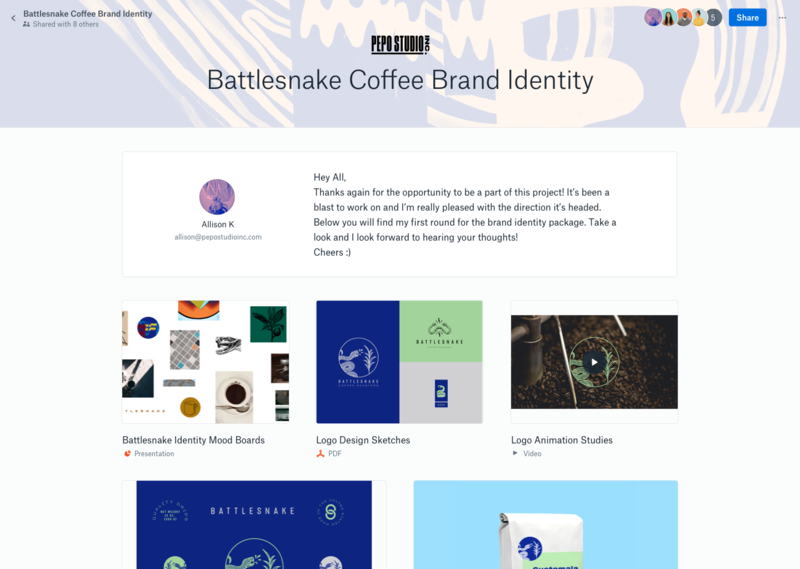 Note: The name, email, and image to the left of the introduction correspond to the creator of the showcase, and their account name, email, and avatar (profile picture). To change the image that appears in a showcase introduction, the creator of the showcase must change their Dropbox account profile picture. You can change the appearance (Zoom in, Zoom out, Fit, or Fill) of an image file that you’ve added to your showcase. To change the appearance of an image file, single-click the image so it’s highlighted, and then click the Edit appearance icon (pencil) and choose from the options in the toolbar. You can add web links to a showcase that will display as clickable images or videos. Click the “+” (plus) at the top left of the showcase. Note: You can also click the Insert link icons to the left of a section or at the bottom of a showcase. The image or video that displays for a web link is determined by the website you’re linking to, and can’t be changed in Showcase. For example, a link to a YouTube video displays as a playable video. Other web links will display as a featured image from that link’s source website or webpage. Note: Some web links do not render an image or a video. Those links display with a simple link symbol. If the web link displays as an image, you can edit the appearance of the image (Zoom in, Zoom out, Fit, and Fill). To do so, single-click the image, click the Edit appearance icon (pencil), and choose from the options in the toolbar. To insert a text block into a showcase, click the “+” (plus) at the top left of the showcase, and then click Insert text block. Note: You can also click the Inert text block or Aa icons in the toolbars to the left of a section or the bottom of a showcase. To edit the text in a text block, single-click the text and edit. To change the position or formatting of a text block, single-click the text, and then choose from the options in the toolbar that appears. To write or edit a caption for a file preview, single-click the file preview so it’s highlighted and click Write a caption below the file. To display a title and filename for each file preview in a section, click the Show titles checkbox at the top right of the section. Single-click a title to edit. Note: The file preview title and caption are unique to the showcase, and do not change the name of the source file in your Dropbox account.